The hogback tombstones inside Govan Old Parish Church are the most distinctive monuments at the site. For many visitors they are what makes the Govan sculpture unique and different. Surprisingly, given the usual interpretation of the hogbacks as representions of Viking houses, this type of monument is not found in Scandinavia. A few examples are found in other parts of Scotland but the five at Govan form the country’s largest single group. The type is found also in northern England, in what was once the Anglo-Saxon kingdom of Northumbria, with a small number in the English midlands (the old kingdom of Mercia). Some of the Northumbrian examples are older than those at Govan and seem to represent the beginnings of the hogback style, with Yorkshire being the most likely place of origin. 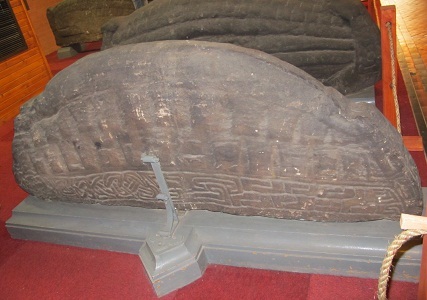 The first Northumbrian hogbacks were carved in the late 9th century, at a time when Viking warlords had seized power at York after ousting the last Anglo-Saxon kings. 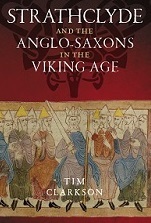 English authority was restored by the powerful kings of Wessex in the middle of the following century but the period of Scandinavian rule had left its mark. 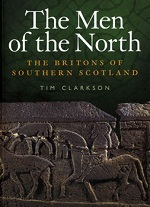 Thus, by c.950, people of Norwegian and Danish origin were settled across many parts of Northumbria. The wealthiest settlers were probably the first folk to request tombstones in the hogback style. They would have commissioned these distinctive memorials from skilled English stonecarvers in Yorkshire and elsewhere. How and why the hogback style came to be adopted by the stonecarvers at Govan is unknown. 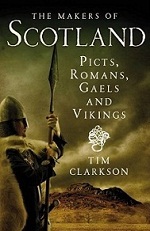 People of Scandinavian origin almost certainly lived in Strathclyde alongside the native Britons, either through inter-marriage or because of some special skill (soldier, sailor, merchant, craftsman). Some may have come from Northumbria in the time of the Viking kings of York, bringing with them a preference for tombstones in the hogback style. Alternatively, the incomers may have been Northumbrians of English ancestry who happened to admire the hogback and who were rich enough to commission them for dead relatives. A third option is that the hogbacks were carved for indigenous Clyde Britons, perhaps for those who had visited Northumbria and seen similar tombstones there. The five Govan hogbacks are the biggest and heaviest examples of the type and must have been very expensive. Too expensive, perhaps, for all but the topmost tier of society. Indeed, it is possible that one or more of them marked the graves of the royal family of Strathclyde. In a future blogpost I’ll look more closely at the sculptural details on the Govan hogbacks. Here, I simply want to compare them with a group of four Northumbrian examples at Penrith in Cumbria. The greater size and bulk of those at Govan is the most striking difference, but it is also interesting to note the similarities. At both Govan and Penrith, for instance, we see the characteristic ‘roof tile’ pattern reminiscent of long wooden houses in the Viking homelands of Scandinavia. If such structures were built in 9th-century Northumbria they may have provided English craftsmen with models for the tombstones of a new Scandinavian elite. 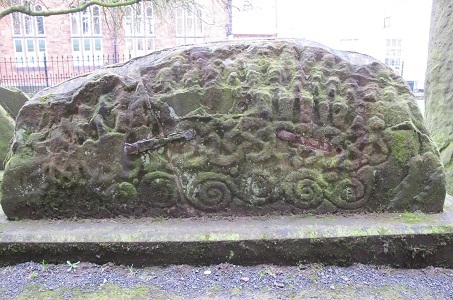 All the Govan hogbacks were carved in the 10th century, the earliest (known as ‘Govan 2’) being similar in shape to the four at Penrith: it is fairly slim, with steep sides. Govan 2 was probably carved c.950, whereas its bulkier neighbours belong to the latter part of the century. 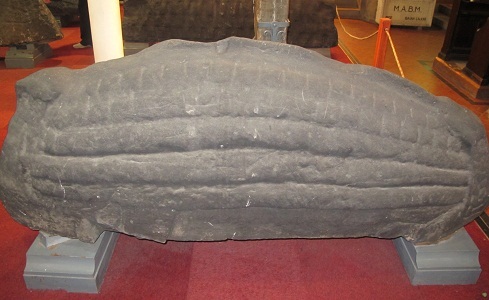 At both Govan and Penrith no hogback is in its original position: the Govan group was moved inside for protection and is now displayed in the old parish church; the Penrith stones sit in the churchyard as integral parts of the mysterious ‘Giant’s Grave’. 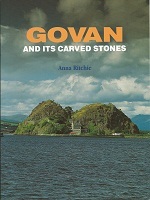 For a brief summary of the Govan hogbacks I recommend Anna Ritchie’s booklet, published in 1999, which is a useful introduction to the Govan sculpture as a whole (and excellent value too). All photographs in this blogpost are copyright © B Keeling. Not heard that particular version of the Owain story. A strange blending of the two prime candidates for Penrith’s ‘Ewan Caesarius’, but my money is still on the Strathclyder. In an ideal world, we’d be able to pinpoint the exact original position of the Giant’s Grave and then the archaeologists could dig down to find out when it was first assembled. I’m assuming the stones were brought together as part of an exercise in early antiquarianism, maybe pre-1500. I suppose it isn’t beyond the bounds of possibility that the assemblage might be even earlier than this, although I think it less likely. Moving the hogbacks would effectively involve desecration of graves so I can’t imagine local Christians being the culprits until such time as the memorial aspect of the stones was forgotten. 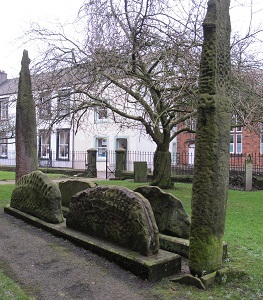 I’ve always seen the Penrith hogbacks as Northumbrian Christian memorials, not as ‘pagan Viking’ ones. The stones are boats. They represent the power of the King or whoever. Imagine a body laid out in a shallow grave. A small boat is inverted to cover the body, then covered with earth. A small mound slowly collapses and then a stone representation of the burial vessel is carved and placed as a monument to the fallen. Job done. …. According to ‘The histories and antiquities of Leath Ward: in the county of Cumberland by Samuel Jefferson, 1840’ the original position of the Giants Grave was directly outside the North door of the older church, prior to the current one which was built in 1720. 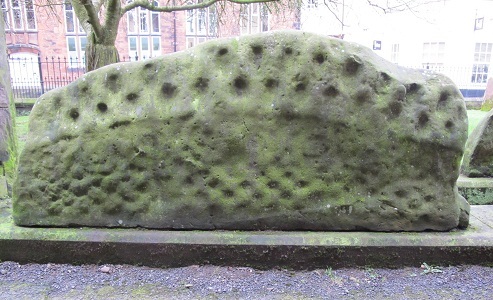 The hogs back stones were described as being on the soil and had sunk partially in due to their weight, they are clearly raised on plinths now. There is also a description of the original grave being partially excavated around the early 1600’s and long ‘shank’ bones and other bones found together with a ‘broad’ sword. I’ve checked sword history and these two handed ‘broad swords’ first appeared in the 6th Century here and continued in use in Scotland into as late as the 18th Century. Description as a ‘broadsword’ might suggest not a Viking sword as they appear to be single handed swords from my research. Thanks for passing on this information. It’s interesting to think about the origin of the sword found in the 17th century. I don’t recall seeing the Jefferson book but I’ll put it on my list of references to chase up. It might be something I’ll add to my older blogpost on the Giant’s Grave. on December 17, 2015 at 7:12 pm | Reply The Hogbacks at Govan Old | History. Heritage. Hilarity.